Photo: Courtesy of Vanity Fair. 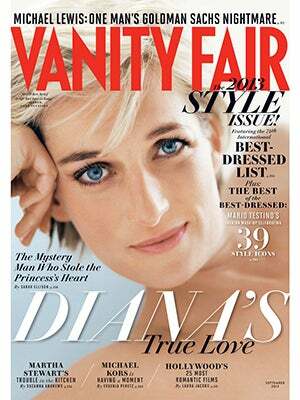 The September issues are coming, and Vanity Fair's is already causing a stir — in its full glossy glory, the late Princess Diana stares at you, bright-eyed. The cover story promises to reveal "The mystery man who stole the Princess's heart," claiming he was "Diana's true love." Photographically, the Mario Testino image is stunning — it was near impossible for the Princess to take a bad picture. Journalistically, however, the image feels exploitative. This isn't the first time VF has posthumously used a celeb's image to move magazines; Marilyn Monroe has graced the cover three times. What's troubling about both these instances is that death does not stop our incessant digging into a celebrity's private life. Yes, it's newsworthy, and we will undoubtably read it, but its worth considering whether or not this violates the late Princess.